This webinar video throws light on the definition of DevOps and why a DevOps culture is required. This will explain how different teams have to be structured, and placed. This webinar will also give an insight into how different organizations have implemented DevOps and what are the best tools. 2. Why DevOps culture is important? 3. How different organizations have implemented DevOps? DevOps is nothing but infrastructure automation. From style check to building the code and deploying it, DevOps begins with development. The term DevOps has been used for many areas, namely automated infrastructure provisioning tools and automation tools as well as for establishing developer work environments to mirror production. In today’s business environment, where everything is moving at a faster pace in this technology-driven world, the idea of being ahead and implementing ideas first is the need of the hour. Secondly, if you realize that you have to fix a bug that you just found on your website, how long would you take to fix it? Ideally, you should not be taking more than two minutes to fix it since you have clients browsing your website. Hence, speed becomes increasingly important. Thirdly, no software is bug-free, but you still have to keep it running. That’s what DevOps is all about. 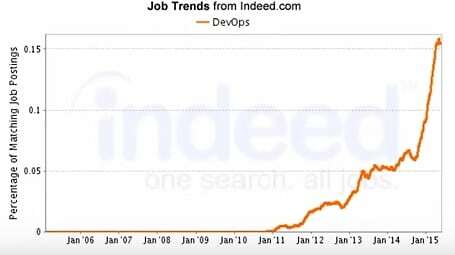 The spike in DevOps jobs began in the year 2011 and it accelerated over the years making 2015 an important year for DevOps professionals. There are different areas in DevOps and it isn’t confined to just one- release engineer, build pipe line engineer or a continuous integration engineer or even an architect. What is a load balancer and how DevOps works on it? Load balancer comes on the production side so if you’re deploying on a cluster which is not one single machine. So since there are hundreds of machines, you need a load balancer that would drive the traffic to hundreds of machines at once. Load balancer takes care of distributing the traffic. If one is not a developer, how to code in C++ or .Net? What ever project you’re using, it’s a good idea to learn a few basics even if you don’t know how to code it. Start getting into the details of your project right away . If you’re working with the code, find out what goes into the code. But if you’re into build engineering then you don’t have to worry about the other things. I’m a college student and I’ve studied computers. How do i learn more about DevOps? There are people from different fields who learn and want to join the field of DevOps and we welcome people with different skill sets. When you go for an interview, regarding DevOps they would ask you about the tools. So you can take up a short term course and study about the tools and culture. DevOps is going to replace SDLC. Learn why?